Traces are a connection between past and presence. In her new installation Anton, Sonya Schönberger adopts a non sentimental approach as she sheds light on the consequences from bygone occurrences to the present day and searches for a reality in the state of the past, which happens in the awareness of being not more than an approach. For her first solo show in New York at Cuchifritos Gallery, Schönberger pursues her investigations into the custody of family memory. In Germany, nearly every family to this day carries individual memories dating back to the Second World war. Whereas for decades after the surrender in 1945 Germany fell silent of the events that had taken place under the Third Reich, the following generations felt the urge to express and understand the past in particular within their own family contexts. Essential questions continuously are raised with regard to guilt, innocence and the perpetrator-victim discourse. With the passing of time, more and more information emerged through personal accounts as well as unspoken narratives that bore visible scars, photo albums and objects that came to the surface. Schönberger’s current residency in New York is dedicated in part to engaging into discussion with US based German individuals and families who witnessed the Second World War; these interviews feed into the pursuit of the artist’s larger and ongoing oral history research project. 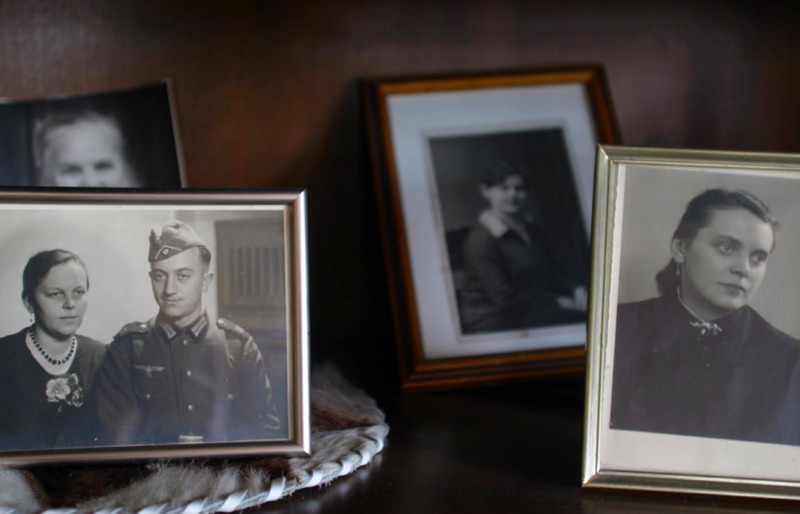 Deeply marked by the war, Schönberger’s grandfather Anton left a number of photographs from when he served as a soldier for the Wehrmacht in occupied France. The five black and white photographs exhibited by the artist at Cuchifritos along with a piece of shrapnel are a legacy from her grandfather. Through an unexpected arrangement of these found objects, Schönberger creates an allegory of the complexity of the consequences of war, the traumas of a whole nation and their impact on the coming generations. In the end, Schönberger’s highly personal viewpoint transforms the discourse into something precisely universal. Organized by Residency Unlimited (RU), Anton is made possible with the support of Artists Alliance Inc (AAI) within the framework of the RU / AAI partnership as part of AAI’s Art (Inter)Actions program. Sonya Schönberger is currently artist in residence in New York City at RU, within the framework of the Residency Unlimited (RU) / Flux Factory (FF) program with support from Schloss Balmoral, Stiftung Rheinland Pfalz für Kultur (Germany). We are grateful to Christof Zwiener for his text. Zwiener is a sculptor and conceptual artist based in Berlin. The exhibition includes contributions by Jodi Waynberg, Colette Urban, Argot Murelius, Mirjam Brusius and Charlotte Cosson. This exhibition is made possible in part by the New York State Council on the Arts with the support of Governor Andrew Cuomo and the New York State Legislature.